More math food blogging: I may need some help from my Southern friends. I think I may have an eating problem. Or just a eating mathematically problem. Here’s my problem today. A can of crescent rolls dough. 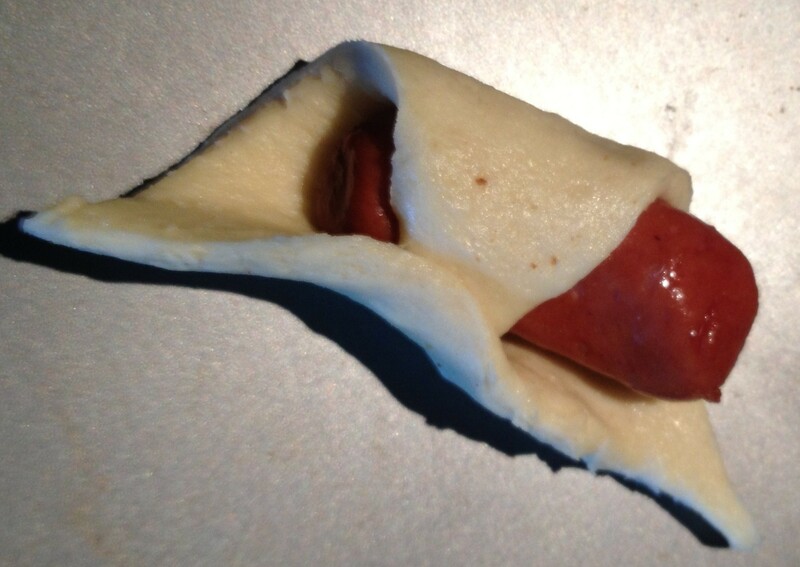 Cooking instructions: Wrap those little buggers up and toss them into an oven until you can’t stand it any longer. At least, that’s how I’ve always made them. Maybe I could get super-ambitious and make my own dough but that sounds a lot of work for breakfast (side note: yes, this is a breakfast food). Here’s the problem. 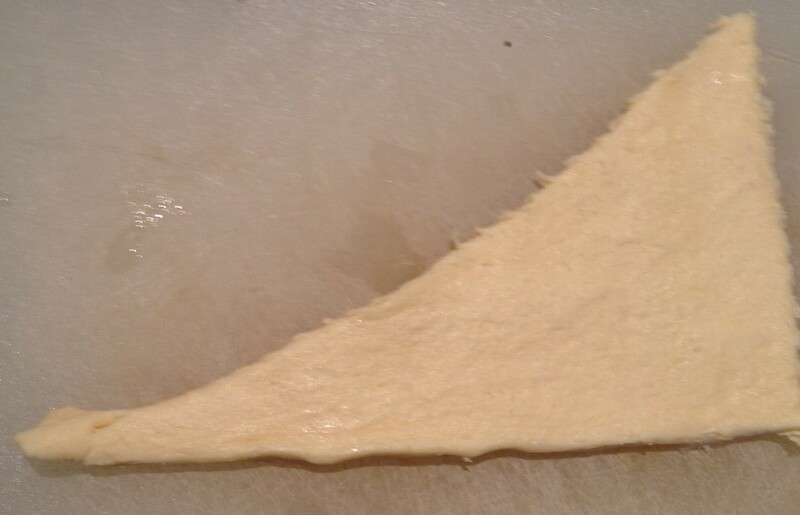 How am I supposed to cut this triangular piece of dough to ensure proper sausage coverage? Like this, this, or this? Or none of the above? I can’t seem to get congruent triangles out of this thing. 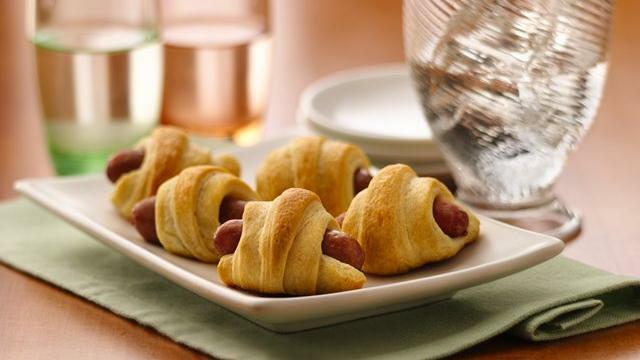 So I end up with mismatched pigs-in-blankets. Some have too much dough, some have too little. Many don’t wrap properly. Like I said, I can’t get the triangles to come out congruent. Not only are the triangles not congruent, they’re not similar at all. They’re not even the same type of triangle. So I need advice on a few levels. 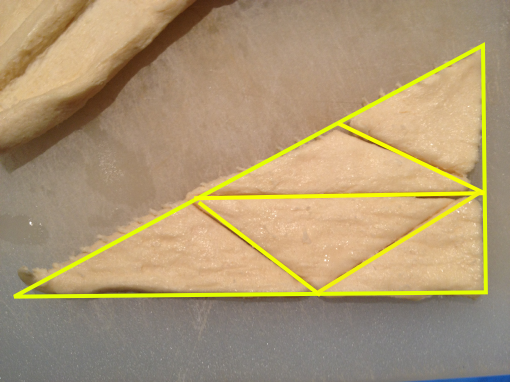 Obtain congruent and similar triangles that make for easy sausage-wrapping? Here’s what I start with. I want to end with those perfectly covered pigs-in-blankets above. How to I get from start to finish? Please let me know in the comments or tweet me a picture of the proper triangle-slicing orientation. Next Entry:CNET has some TV viewing size/distance recommendations. This looks a lot like a similar triangles question to me. Here’s my (approximate) solution: http://www.flickr.com/photos/65802285@N06/8167412909/in/photostream This solution can be improved by ensuring that the delicious croissant triangle is a bit more right-angley, and the hypotenuse of said right triangle is straighter. I’m wondering if this is worth of a Geogebra investigation. 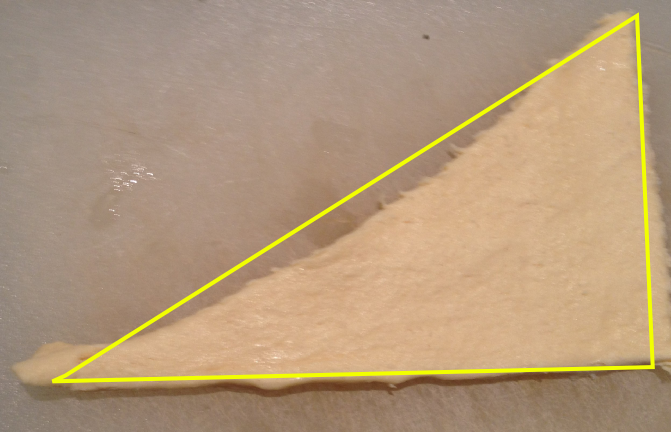 Something like: divide this triangle into equal parts. Group who comes up with the “equalest” gets a cookie (or a pig-in-a-blanket). You could show the area or ratio right there in the geogebra worksheet. Hmmm…. Estimate the midpoint of each side and connect them….you should have yourself 4 congruent pieces all similar to the whole. You could also make 9 congruent pieces but I’ll leave that for you to play with. BUT, now I’m wondering if it would be possible to make ANY number of congruent pieces. My intuition is saying no, but I’m curious. Thanks for the post. Instead of using a triangle I always put the other half with it, and use a rectangle to ensure proper dawg coverage. I find bun length dawgs work best with that amount of dough.